Although realtor.com has been slowly chipping away at zillow.com’s position as the U.S.’s chief real estate website in 2015, May saw Zillow extend its lead over both its rival and other real estate sites. 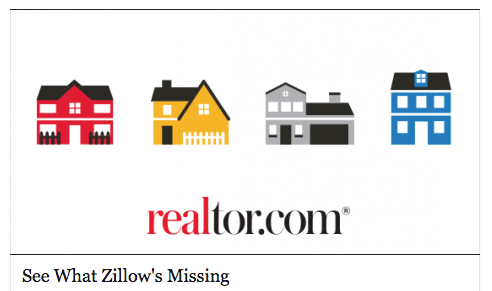 All eyes are on how Zillow Group’s flagship site measures up against re-energized rival Move Inc.’s realtor.com, the official consumer website of the National Association of Realtors. Source: Experian Marketing Services *Does not include traffic from mobile apps **Zillow Group owns both zillow.com and trulia.com and powers real estate search at homes.yahoo.com. Starting the year with a Web market share 11.67 percentage points behind zillow.com, realtor.com trimmed that to a deficit of 11.12 percentage points in April. Its market share of 10.6 percent in May extended Zillow’s lead to 11.77 percentage points. Stimulated by a new owner in global media giant News Corp., realtor.com operator Move Inc. has executed a variety of aggressive moves to grow its portal’s consumer mindshare and take on Zillow Group, which, over the course of the last several years, has established itself as the runaway leader in the space. In May, realtor.com unveiled a rebrand, complete with a new logo and new national TV spots. It has also been running aggressive digital ads that go after Zillow by name and paid for a news outlet to attend the NAR Midyear meetings in May, where it presented its new look. Screenshot of one realtor.com’s newer digital ads. Time will tell whether those moves, along with News Corp.’s plan to buoy realtor.com traffic by cross-pollinating content between it and its other media sites like The Wall Street Journal, will bear lasting fruit in the quest to cut into Zillow’s audience lead. Zillow Group’s not sitting idly by. It has earmarked $100 million for its consumer marketing campaigns for its four consumer brands this year. The two would be wise to keep a side-eye on tech-focused brokerage Redfin, which has a popular, streamlined website and continues its blazing expansion pace in 2015.